Rusted Rail is proud to welcome the Big Eyes Family Players into our community. This avant-folk collective started life in Leeds , England as Big Eyes back in 2000 with the intention of creating classical music without any real training or knowledge of the genre. 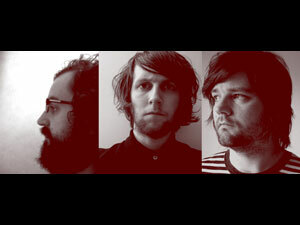 The ensemble recorded four albums until 2004 when the group disintegrated and reformed as The Big Eyes Family Players. The new name held a new aim - more collaboration and experimentation under the chamber/folk blanket. Previous collaborators have included Jeremy Barnes from Neutral Milk Hotel/A Hawk and a Hacksaw, Rachel Grimes from Rachel's and James Yorkston. For "Donkeysongs" the trio of James Green, David A Jaycock and Chris Boyd conjured sounds from guitars, harmonium, violins, drums, harp, kazoo, piano, recorder, water-bird-whistle and organ, with the resulting folksongs and chamber compositions nestling comfortably beside pieces made entirely from looped material. 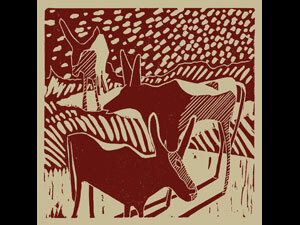 This 5inch hand-stamped album is housed in a handmade sleeve featuring a lino cut by James Green.